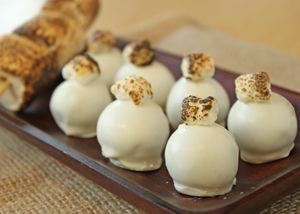 Toasted Marshmallow Truffles have double the toasted marshmallow flavor--real marshmallows are mixed into the white chocolate ganache, and then each truffle is decorated with an individual, toasted marshmallow on top! You'll never want to have a plain white chocolate truffle again after trying these! A kitchen blowtorch is the easiest tool for toasting the marshmallows, but your oven's broiler will also do a good job if you're lacking a blowtorch. 1. Spread 1 cup of the miniature marshmallows out on a baking sheet lined with a Silpat silicone liner or aluminum foil sprayed with nonstick cooking spray. If you have a kitchen blowtorch, use it to toast the marshmallows until they are dark brown and puffy—some burned bits are okay too, just don't leave them too pale. Overdone is better than underdone so that the "toasted marshmallow" flavor really shines! If you don't have a kitchen blowtorch, turn on your oven broiler element and put the tray in the oven as close to the broiler as possible. Watch the marshmallows very carefully, and broil them until they are dark brown and puffy. Let the marshmallows cool while you prepare the next step. 2. In a bowl, combine the white chocolate and the heavy cream. Microwave them together until completely melted, stirring after every 30 seconds to prevent overheating. After the white chocolate is melted, add the room temperature butter and the pinch of salt and whisk it in until it's completely melted and smooth. 3. Now add your toasted marshmallows and whisk them in. If your white chocolate mixture is still fairly hot, they should start to melt into the white chocolate—this is good. If they stay in large clumps and don't melt, microwave the mixture in 10-15 second bursts, just until the marshmallows start to melt and are no longer in large pieces. 4. Once the mixture is mostly smooth, cover the top with a piece of cling wrap and refrigerate it until it is firm enough to scoop, about 2-3 hours. 5. While the white chocolate firms up, prepare the optional marshmallow toppers. Spread about 2 dozen miniature marshmallows far apart on a baking sheet lined with a Silpat or foil sprayed with cooking spray. Again use a blowtorch or your oven broiler to toast the individual marshmallows until they are puffed and dark brown. Set them aside to cool. 6. Once the white chocolate is firm, use a teaspoon or a candy scoop to form small 1-inch balls. If they stick to your hands, dust your palms with powdered sugar and roll them between your palms to make them round. 7. Melt the white chocolate candy coating until it is completely liquid and smooth. Using dipping tools or a fork, dip the truffles in the melted coating and place them on a foil-lined baking sheet. While the coating is still wet, top each truffle with a toasted marshmallow. 8. Store Toasted Marshmallow Truffles in an airtight container in the refrigerator for up to a week. Allow them to sit at room temperature for about 20 minutes before serving. Click Here to View All White Chocolate Candy Recipes!